Amaryllis (Hippeastrum) is a bulbous plant, in the flower industry sold as winter-flowering houseplants and also as fresh cut flowers. This product is widely sold in the winter months for their ability to bloom indoors. 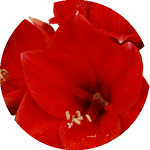 As a cut flower, Amaryllis is a stunning product ideal for use in events and weddings and will look spectacular in both centerpieces as well as bridal bouquets. Cut Amaryllis can be stored dry in the original box for several days in a floral cooler if that is so desired to fit the schedule of the event you are using the Amaryllis for. The buds will remain closed in the box, as they are shipped tight to minimize damaging during shipping. When it is time to process the product, carefully take the stems out of the box, making sure not to squeeze the stems too forceful as they will crack easy. Prepare a tall bucket (as tall as you can find) and fill with lukewarm water. Cut off 1-2” off the bottom of the stem. If the bottom is cracked just go ahead and cut off the cracked portion. If you cannot find a tall bucket cut a piece of cardboard – the length of the Amaryllis stem – (make sure you keep the cardboard below the buds) and place in your bucket to support the weight of the stem. Make sure you keep the bottom of cardboard above water. Place the bucket in a bright spot but not in direct sunlight. Finally: if the Amaryllis stem is cracked all the way up the stem it is a common practice and a handy tip from floral designers to insert a wooden or plastic stick into the stem of the Amaryllis to help support the weight of the buds. With this support stick, the Amaryllis will still bloom out as usual and it is invisible to the end user. Amaryllis have hollow stems so this trick of inserting a stick is brilliant. Amaryllis is a very stunning and rewarding cut flower, they come in many colors and usually last for a long time. As Amaryllis typically comes with several heads (2-4 is typical), you can just remove the wilting flower bud when one bloom has fully bloomed, and watch the other open up. Usually cut Amaryllis has 3-4 buds, this, of course, depends on the grade you purchase. Note: as an Amaryllis bloom opens up, you will see stamens covered in pollen, similar to Lilies. The pollen from the Amaryllis does not stain as badly as Lilies, but feel free to remove the stamens to avoid any mess.